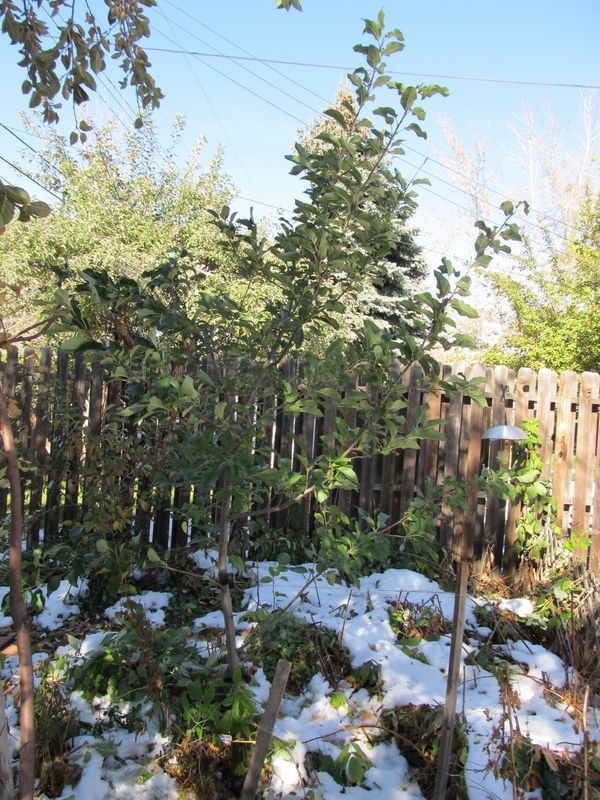 Ummm…should the apple tree be horizontal? A few more inches fell after this. See the oak tree- it looks like a candy cane. 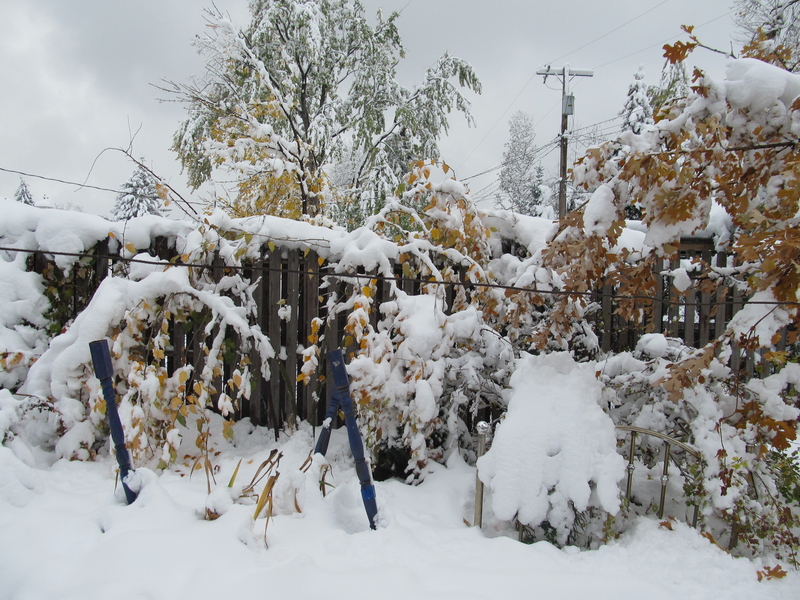 We had a wet heavy snowstorm last week, and people all over town lost electricity from branches falling on power lines, lots of tree damage all up and down the street. We got lucky- full power all day and just a couple of branches gone from the ash tree in front. I thought we had gotten lucky until I did a fuller inspection of the back yard. My golden delicious apple tree was uprooted. Completely knocked flat. It is in a shaded spot, so the snow took a long time to melt from it, the way it has melted from the other young trees and bushes. I was hesitant to go out and mess with it right away. Do you see the apple tree? Me neither. My plan: first drive some stakes into the ground (it wasn’t staked previously, and it had started to lean when it was weighed down by apples) then pull it upright, stomp on the soil all around it and add some mulch. 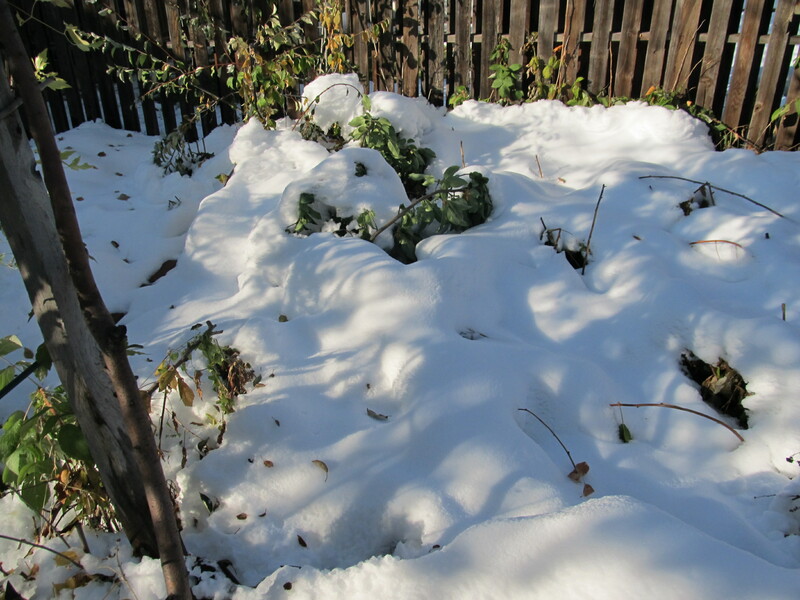 It might not survive the winter, which is really too bad, because it had just started to produce. I always read in garden design books and magazines about planning for “winter interest.” That means making sure there are evergreens and structures that look pretty in the snow. It is not supposed to be interesting like the Chinese curse,”may you live in interesting times.” Winter interest is not looking out the window and wondering if your trees are going to die! This storm was unusual, but not unheard of. There’s a reason why this region is not forested- there are enough pre-halloween storms that break lots of limbs, and enough May freezes that kill buds to make this a very tricky place for trees to survive.